Stylist extraordinaire Rino Balzano, has earned the prestigious title as a Portfolio Artist for L’Oreal Professional one hair cut at a time. Rino was born and raised in the multicultural city of Toronto, launching his career at sixteen years of age. Since then Rino’s career has soared. 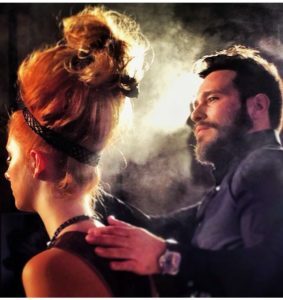 Rino Balzano is a celebrated stylist and educator in the greater Toronto area. He is also the proud new partner/owner of Taz Salon. Rino specializes in precision cutting and in a von guard hair designs. As a trend-setter, he works with a creative artistic vision and a fine eye for detail. He enjoys working collaboratively with his clients through in-depth consultations to develop original and individualized styles to meet their needs. Rino has also gained the admiration and respect of leading hair stylists, major fashion magazines, celebrities, clients and industry competitions across North America, most recently being honoured at the Mirror Awards for Fantasy Style. Rino’s passion and talent is evident in every hair cut he undertakes. Through his precisely detailed, innovative cutting techniques and styles, he is able to create hair for a variety of lifestyles. Though cutting and styling are just a few of the skills Rino utilizes, he is also proficient in colour, permanent wave, relaxers & extenso. Rino is a firm believer that education is the key to a long, rewarding and successful career. With his exceptionally high level of motivation, he maintains current and fashionable knowledge to provide an advanced platform of hair styling education in salons nationally. But it doesn’t stop there. He is very dedicated to his team at Taz Salon providing in-salon education, support and training. “It’s a sense of satisfaction I receive in knowing I’ve helped my team to become more successful; a goal achieved for myself”. Bridal: With his passion for beauty & sheer creativity, Rino is the go-to-stylist for beautiful glamorous hair, whether it be chic runway looks, or brides to be. All consultations are thorough and complimentary. Education: Portfolio Artist for L’Oreal Professional, Rino offers both in salon and one-on-one training and education for experienced stylists. His classes are specially designed to allow students to gain the confidence, ability & expertise needed to apply today’s current trends & fashion forward looks behind the chair. Rino’s educational classes include Cutting techniques, Cut & Colour, Up-do 101, Bread & Butter and Session Styling.